Hospitals and other care organizations are turning to clinical communication & collaboration solutions—often referred to as CC&C systems—as a way to improve care-team coordination and to expedite care delivery. But there’s an unexpected challenge with this journey. These clinical communication solutions are changing so rapidly, it’s not easy for IT decision-makers to be confident with their vendor selection. You want to pick the best system for your organization, but there are so many factors to consider. And the factors keep changing. At any moment, you don’t know what you don’t know. • You’re an IT professional in a healthcare organization that provides direct patient care. • Your organization is thinking of purchasing a new system to support clinical communications among your clinical and administrative staff. 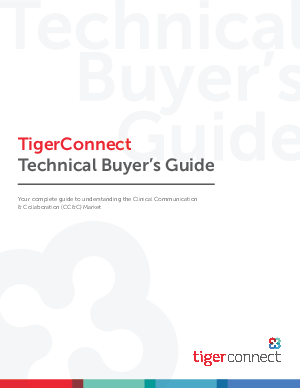 • You’re looking for technical details that will help you choose the best communication solution for your organization.